At its best the experience of film is magical. By this I don’t mean the fantastical special effects that have become so commonplace that they no longer thrill but rather the moments when the sum of a film’s parts suddenly become more as a whole. Writer-director Alice Rohrwacher’s Happy as Lazzaro is an example of this. The title, in English, seems to be based on the simile ‘happy as Larry’: this works in the sense that nothing gets Lazzaro down; he’s played with engaging blankness by debutant Adriano Tardiolo. He is a ‘simple’ ‘innocent’ who only want to please. I guess the name’s more likely reference is Lazarus for reasons I won’t divulge for fear of ‘spoiling’. The first part of the film seems to be set in early 20th century rural Italy where sharecroppers eke out a meagre existence and use Lazzaro for the jobs they don’t want to do. Although they are exploitative, they do so with affection. The marquise, however, exploits with contempt and ensures the villagers remain in her debt. About half way through there is an abrupt change of tone that requires great confidence from a filmmaker to bring off; Rohrwacher succeeds. The film is shot on Super 16mm in 1:1.63 ratio with the corners rounded giving an old fashioned feel to the look. The warmth of the rural environment is followed by the cold urban world of the city and at one level retains a social realist aesthetic narrating the lives of those ‘down at heel’. In one shocking sequence, migrant workers are seen outbidding one another for work: the lowest bid wins. Rohrwacher’s film is about exploitation in the ‘old world’ of Italy and in the new globalised world. Social realism can, rightly, be grim but Happy as Lazzaro is leavened with humour and the ensemble cast, including Alba Rohrwacher, the director’s sister, are excellent; special mention must go to Sergi López who reminded me of Bob Hoskins in his prime. That said it isn’t a realist film so you will have to go see it to understand this contradiction. Lazzaro is in a way he is like Voltaire’s Candide but he is not disillusioned when he enters the ‘real world’. Rather he retains his faith in humanity which, as Rohrwacher shows, is difficult in the face of exploitation but crucial if we are to retain our humanity. I need to catch up on her other films. It was a coincidence that I saw these two films about aging close to one another. The timing was apposite as I’m at the time of life where there’s a definite sense of ‘before and after’, like being a parent, but now it’s to do with the ending of a career. Youth is Paolo Sorrentino’s ‘laddish’ take on old age; Michael Caine and Harvey Keitel play characters in their eighties. While Caine, a composer, has retired, Keitel is a director and is trying to script his ‘greatest film’. They have been friends for 60 years and cantankerously deal with failing memories with some very droll lines: “Remember yesterday we were talking about children?” “No”. Caine is particularly good, his large glasses evoking his ‘60s persona when he was British cinema’s ‘dish’. The pair rattle around a luxurious Swiss spar – cue beautiful landscape – observing bodies both youthful and decrepit. The pleasure in the film is in the dry comedy and the performances including a great cameo from Jane Fonda. Sorrentino directs with panache, some of his compositions are magical. 45 Years, on the other hand, is more philosophical. Charlotte Rampling and Tom Courtney’s couple are about to celebrate 45 years of marriage when the latter receives news that the body of a former love has been found preserved in a Swiss glacier. The corpse, Katya, predates Rampling’s Kate but the letter catapult’s Geoffrey into his past and his wife is unsure suddenly about her status in their relationship. If Youth focuses on thinking about the past then 45 Years drags the past into the present. Haigh, whose debut Weekend was impressive, keeps the camera mostly on Kate as she struggles to deal with the secrets she finds after 45 years of marriage. The final shot, a long dolly into her amongst a crowd of people, is a brilliant ending. I can’t say I’m any wiser having enjoyed both films. As a youngster film was so vital because it could teach me so much however, having watched several thousand films, not to mention the other art I have consumed, it becomes harder to find the insight art can provide. The protagonists of both films are much older than I but they do give me a glimpse of what may be ahead of me. Michelangelo Frammartino’s unusual film appears to offer four slices of life in a rural backwater of southern Italy (Calabria). Not a lot happens here but the film is entrancing in surprising ways. There’s no intelligible dialogue (nothing is subtitled), the dominant sound on the soundtrack is the bleating of goats (I’d had enough of that by the end; we do hear the ambient sounds of the town. The central character, if the definition serves, is the goat herder who is obviously, from the start, going to die soon. It’s not only the fact he’s very old but he coughs a lot; a sure signifier of death. That’s hardly a spoiler because what happens is not important, what matters is simply that it happens. 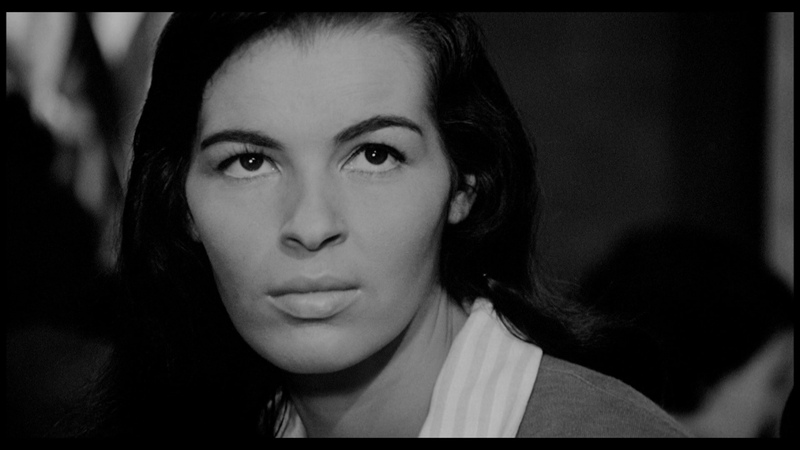 Cinematically it’s interesting as Frammartino often places his camera in a position simply to observe events mostly disallowing the director’s privilege of putting it anywhere he likes. There are, for example, very few close ups (this is one way of avoiding the problem of performance when using an amateur cast). One position allows us to see the goats’ pen and the herder’s home in the background. During the Easter parade, which marches past this position, we witness farcical happenings that belong more in a black comedy than a low-key representation of routine. This startling clash works but I’m not sure why. Frammartino is recording the end of tradition as the herder’s successors work in different ways. I wonder about the representation of the Easter parade; is it meant to be laughable or is that my perspective colouring what happens? There is one dramatic moment, the brilliant cut from the herder’s coffin’s incarceration to the birth of a goat was as visceral a scene I have watched recently. I am slightly concerned that we were meant to think the herder had been reincarnated in goat: ridiculous or more skewed humour? The film’s short (88 minutes) but that was long enough. Documentary filmmaker, Andre Segre, chose a ‘slice of life’ narrative for his first feature and an affecting on it is. Li Shun (Zhao Tao) is working in Italy, paying off the snakeheads who organised her passage, and hoping that her eight year old son can join her. Zhao is a Jia Zhangke regular (see Still Life) and is quite brilliant in this submissive role whilst conveying her inner steel. My work life at the moment is pretty abysmal, however the fortitude of migrant workers renders me pathetic. She forms a friendship with a much older, sympathetic fisherman, another emigre, albeit one who’s resided in Italy for 30 years; played by prominent Croat actor, Rade Sherbedzia. I was slightly uneasy that a cliched romance between an old man and younger woman would develop, however Segre, who also scripted the film, is too adept for that. Apart from the performances, what stands out in the film is the cinematography by Luca Bigazzi (a character from The Godfather?). The setting is near Venice, we do have one sojourn into that most photogenic of cities, and the sea and lagoons of north east Italy look superbly melancholic, especially when the Dolomites, seemingly miraculously, appear in the background. The Battle of Algiers is an extraordinary film for a number of reasons, primarily the impartiality with which the events are portrayed and the style in which it is shot. It was made just after Algerian independence from France and focuses upon the battle for the capital city in 1957, which although a failure for the National Liberation Front (FLN) at the time, sowed the seeds for the eventual withdrawal of France. Director Gillo Pontecorvo drew upon the Italian tradition of neo realism by using non-actors, except for the vital role of Colonel Mathieu, and location shooting. The latter was possible as the film had the cooperation of the Algerian government. Despite the fact that the government’s involvement might suggest a propaganda , nation-building, purpose for the film, Pontecorvo, and screenwriter Franco Solanas, do not portray the French as monsters. Indeed, the even-handedness of the way each side is presented is quite remarkable; both commit atrocities and deaths on both sides are shown to be equally tragic. For example, the bombing of the Casbah, by off duty French policemen, is followed by the equally cold blooded bombing of, amongst other places, a milk bar full of young people. Whilst it is clear that the atrocity committed by the French was answered by Algerian revenge, Pontecorvo spends more time emphasising how innocent the French victims are through a series of eyeline matches from the woman planting the bomb. The aftermath uses the same music, Bach’s B minor Mass, which also accompanied images of the dead being dragged from the rubble in the Casbah. 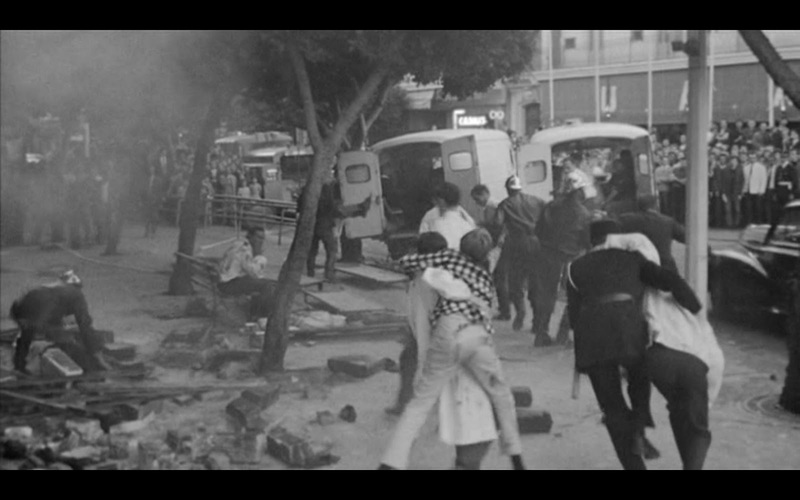 Later, Algerian ‘freedom fighters’ rampage through town in an ambulance shooting anyone they can. This is in response to the torturing of Algerians as the paratroopers tried to track down the FLN’s leadership. Col. Mathieu is even allowed to justify the use of torture, though this is used to illustrate politicians’ hypocrisy. As he says, if you wish Algeria to remain French then it must be done. Mathieu is no cardboard villain but a compassionate, professional soldier, played with great charisma by Jean Martin (who’d lost a part because he signed a petition supporting Algerian independence). On two occasions, when French passers-by attack Algerians in hysterical revenge for killings, it is gendarmes who come to the rescue. It’s not obvious as to why the French banned the film for many years. I should make clear that the film doesn’t condone torture; the scenes are quite horrific and the film’s viewpoint is obviously anti-colonialist. The French should not be there; there should be no reason for torture. Unlike the neo-realists, the event portrayed is not insignificant but a decisive moment in Algeria’s fight for freedom. Also, the use of faux newsreel footage (the image was processed to look grainy) is a departure from neo realist technique. It does, however, give the film immense immediacy. I have to keep reminding myself that the film is a recreation; Paul Greengrass achieves the same effect with Bloody Sunday (UK, 2002). A final point to make, and something that has been reflected in the Arab Spring, is the vital role of women in the uprising. Three women plant the bombs that kill many and the final shot of the film is a woman, holding the national flag, who keeps coming forward despite being pushed back by French security forces. The Battle of Algiers is one of the greatest films of the 20th century. What happens when you watch a ‘classic’ movie – and there are not a lot that are more ‘classic’ than Bicycle Thieves – and you think ‘that was good’; ‘good’ is not good enough for ‘classic’. The ‘good’ reaction was the first I had nearly 30 years ago, when I saw the film twice; in the intervening years I’ve seen it on two more occasions and now agree with the ‘great’ and the ‘classic’. The film hasn’t changed though it has gotten older. It was a ‘mere’ 30-odd years old when I first saw and that amount of time has passed again; it’s not getting better with age, it was a classic in the ’80s, so presumably I’ve become more discerning. In the decades between first seeing it and now I’ve become a dad and I suspect that’s made the difference as the key to the success of Bicycle Thieves is Bruno, Ricci’s faithful son. Children, of course, are often used to pull the heartstrings but di Sica, and his scriptwriters, use Bruno with subtlety. There’s no sentimentality of the portrayal of the father-son relationship, Ricci’s stress leads him to strike Bruno and then buy him lunch in a posh restaurant to assuage his guilt. Bruno goes off on a sulk at one point, Ricci allows him then fears the worse as someone nearly drowns in the river. These events encapsulate parents’ treatment of, and anxieties about, their children. Throughout the film, di Sica occasionally gives us Bruno’s viewpoint, though Ricci is the protagonist; and Bruno is always there doggedly supporting his dad. The ending, when Ricci loses his moral authority over his child, Bruno slips his hand into his father’s cementing the bond between them. This simple hand-holding gesture was similarly effective in Mandy (UK, 1952). Bicycle Thieves is not simply a great film because of Bruno, it’s portrayal of desperate poverty remains potent but what excuse is there now? Post-war Italy was bound to be a place in turmoil, for the rich – of course – it was different, but in the early years of the 21st century in the ‘advanced nation’ that is Britain we are faced with vast cuts in public spending which will inevitably disproportionately impact on the poor. And the reason for the dire state of public finances is the bailing out of the private sector banks. Neo realist films were politically left wing, what we need now is a left wing party that will increase taxes for the rich to pay for public services for all. Germany Year Zero was director Roberto Rossellini’s third World War II film and it followed Rome, Open City (1945) and Paisa (1946) in filming, on location, the ‘here and now’ of the end and aftermath of the war. While both use melodrama as much as realism, Germany Year Zero is probably the bleakest, which is fitting given the devastation visited upon the defeated Berlin. I was glad that the film runs only 70 mins (on DVD) as the graveyard scene at the start sets the tone and it gets progressively grimmer. It would be interesting to compare the film with the noir The Third Man (UK, 1949) shot on location in Vienna, which I haven’t seen for some time. Whilst I admire the British film, compared to Rosselini’s portrayal of the degradation forced upon people by war simply ‘cuts to the chase’; or rather, it doesn’t bother with philosophy it simply shows the ‘state of things’ for the defeated nation. Like Rome the use of location shooting is crucial to realist project, though unlike in De Sica’s work, most of the actors are professionals. The shots of the people looking at the camera as they get off a tram signifies the film’s authenticity in that it was obviously ‘there at the time’.